Home Match Our Capital One Cup Final Team To Face Chelsea – What’s Yours? Our Capital One Cup Final Team To Face Chelsea – What’s Yours? It’s the big one and here’s the team we’d pick to face Chelsea. There is a debate over who will start in goal but not from the fans. It has to be Hugo Lloris and Mauricio Pochettino will leave himself very open to criticism if he doesn’t agree. The defence is likely to be the same one that faced West Ham on Sunday. Ben Davies played well in midweek but Danny Rose had a good game against Chelsea at White Hart Lane and his energy down the left will be needed. The central midfield duo also picks itself, but further forward there is a conundrum. Mousa Dembele was on the bench against Fiorentina, so does that mean he’ll start or merely that Pochettino was extremely unimpressed with his performance against West Ham that he’s out? We wouldn’t start him. Andros Townsend starts ahead of Erik Lamela, Christian Eriksen takes up the central berth and Nacer Chadli plays on the left. Chadli caused huge problems in the 5-3 victory and be relied upon to track back. In front of them there is only one option. 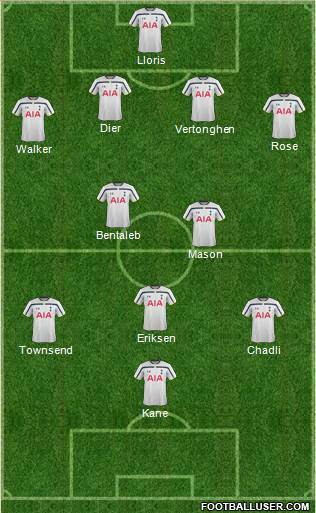 Lamela for Chadli and Dembele for Townsend. Lamela for Townsend. Neither are ideal but Townsend could be more effective as an impact sub with 20-30 to go as legs tire. And I would play Davies ahead of Rose….too many goals come down his side due to his errors. Davies is less spectacular but our first task is to stop Chelsea scoring. So then, Chelsea are winning the mickey mouse cup this year. Can’t really trust Lamela for this one.